Common Nighthawk has been off my life list for an embarrassingly long time despite the fact that I’ve lived smack in the middle of its breeding range for about the last 20 years. To make matters worse, this is a bird that can be seen easily from a mile away; and it’s not really hard to identify it. The only thing that makes the common nighthawks a little challenging is that it does come out in the evening after most birders who gone home for the day. If you get up at 6 AM to catch the dawn chorus, you’re going to be pretty tired by the time you see your first Nighthawk. It pretty much requires a special trip. Nonetheless, it isn’t that hard to find and yet for reasons I can’t fully explain, I have missed it time and time again for years. 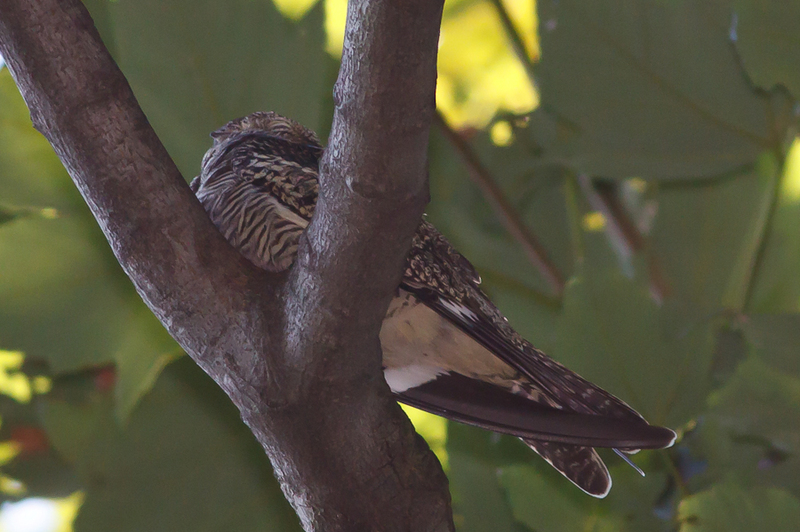 For instance, a few years ago nighthawks were flying over the Turtle Pond in Central Park every night for several weeks until the night I took the subway out there to see them at which point apparently every last one of them had decided to migrate south. I have gone on nighttime walks in Prospect Park, and shown up two minutes after nighthawks flew over and everyone else saw them but me. I have been out to numerous locations where they are known to fly nightly and still managed to miss them time and time again. Most recently, yesterday, Saturday, I was on a Brooklyn Bird Club trip to Jamaica Bay when the leader got separated from the group. He saw two nighthawks fly over while I was busy looking at yet another Black-throated Blue Warbler. There were more announcements from Canon today of more new equipment than I ever remember seeing from them before. If Canon was making computers, there’d be enough meat here for a MacWorld keynote. I hope they keep up this pace in the future. Previously, they’ve been rather lackadaisical about releasing new professional grade equipment. Some of their lens models are almost 20 years old at this point. Let’s hope this is a precursor of more cool things to come. And now on to the specifics. The 60D was decidedly underwhelming. In some ways, it’s a downgrade from the 50D, especially if you don’t want to shoot video. It is slightly lighter, which is nice, and the controls it removed are controls I’ve never used anyway. Perhaps I’d find a use for the articulating screen. However I was really hoping for something that would be an improvement on the 7D, not merely a slight upgrade over a Rebel. Features I was looking for included better high ISO performance, waterproof, 45 point autofocus, better autofocus, ring of fire, and the ability to autofocus at f/8. Just maybe this camera has less noise at medium and high ISO than the 50D does. Once again, we’ll have to wait for reviews to find out. However it failed to meet all the other desiderata. At $1099 (body only) it is reasonably priced, but unless you want to shoot video you might well prefer the slightly cheaper 50D. Can the Livescribe Pen Recognize Cursive? two 0’s in the name (44100, 60-ogb). 100 avian dollars in ayuht. Surely I’ve seen a Winter Wren before now? Well, yes I have. Many times and on more than one continent. However, the American Ornithological Union has just split the species into 3, Pacific Wren (Troglodytes pacificus) in the Pacific Northwest, Winter Wren (Troglodytes hyemalis), back here in New York, and Wren (Troglodytes troglodytes) in Eurasia. In fact, I’ve seen all three, Troglodytes hyemalis from New York and other locations, Troglodytes pacificus in the Bay Area in California, and Troglodytes troglodytes from Europe. I’m not sure which I saw first, Eastern or European. It may actually have been the European species back when I first started getting serious about this. You are currently browsing the Mokka mit Schlag weblog archives for August, 2010.